Y'all, yesterday was the most insane day! Did you get to shop? Because of all of Nordstrom's site issues, they are giving us 10 times the points on all of our purchases made yesterday! I was already using my triple points day... kinda wish I would have saved that now, but oh well. I'll take 10 times the points any ole day! I placed several orders throughout the day, and I'm sharing what all I got with you today! 1 or 2 of these items are already sold out (of course), but some are great basics that are still in stock! You can click on the items in the collage below to be taken directly to the site. Before I tell you a little bit about each item I purchased, I want to tell you about a new page on my blog. If you go to the top of the page and go to the menu, there is a page called N Sale! If you click on that, you can see all of the best items included in the sale broken down by category! I hope this is helpful for you! Wubby Fleece Pullover- This was the first item I purchased yesterday morning around 3 AM! My mom also purchased this. She was deciding between sizes, and the one she ended up wanting sold right out of her cart. Hurry fast if you want this! It is in high demand, and it is going to be what I live in with leggings while I'm at home in our freezing cold house! 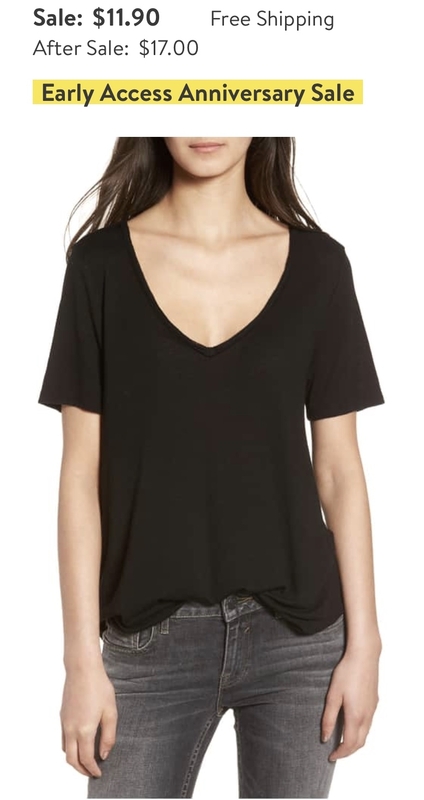 Side Tie Tunic Top- If you don't have a Nordstrom card and you like this top, you are in luck! It is not a part of the N Sale, so you can still order it without having a card! And it is currently 40% off! My mom and I both ordered it in white, and we also want the yellow and gray. I think this looks like the perfect comfy but cute top I will wear on repeat all fall! Love the length and ties on the sides! BP $12 Tees- This is one of those great basic tees I want in every color! I checked out my vneck shirt situation in my closet and realized I have 100 white vneck tees, but no black ones. So I ordered a black one and would like one of each of the other 8 colors. Such an amazing price! 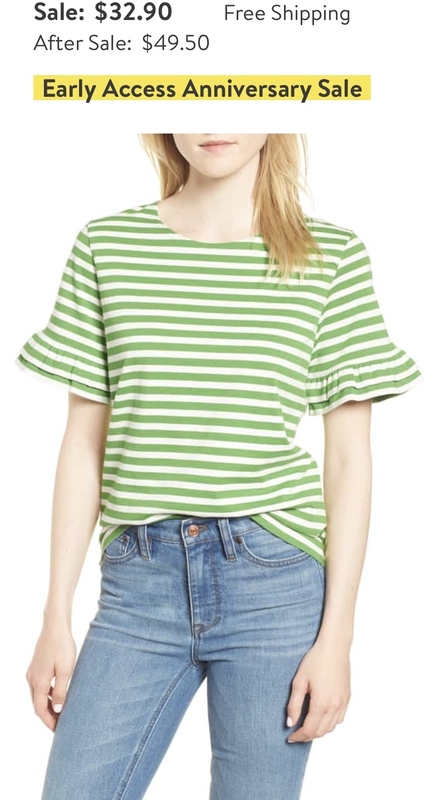 J.Crew Ruffle Sleeve Tee- I somehow missed this tee when I was psychotically linking all of my favorite things for y'all in the wee hours of the morning yesterday. However, my mom sent a picture of her order to me, and I immediately added this to my cart. We both got this cute ruffle sleeve tee! 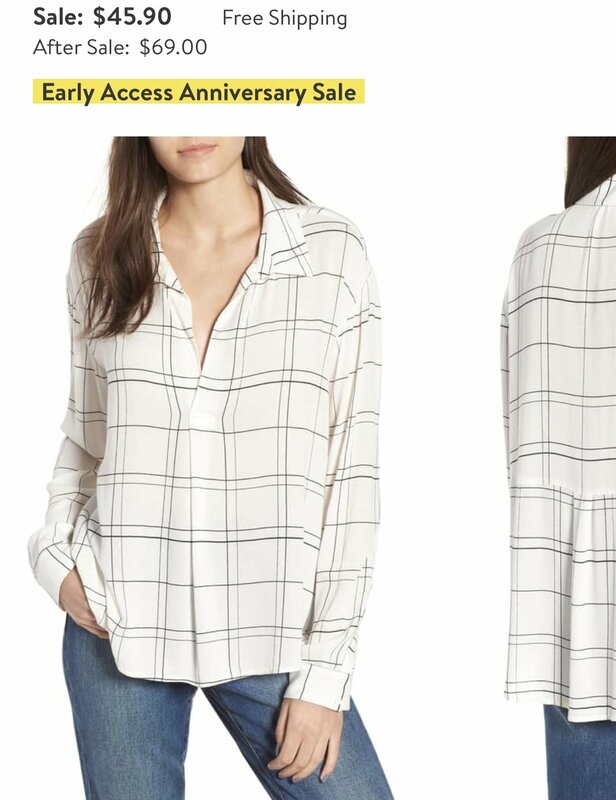 It sold out at J.Crew at one point, so I'm extra excited Nordstrom included it in their big sale! City Check Shirt- I loved this as soon as I saw it. Unfortunately, it is almost sold out. However, I'll leave the link here in case it gets restocked! 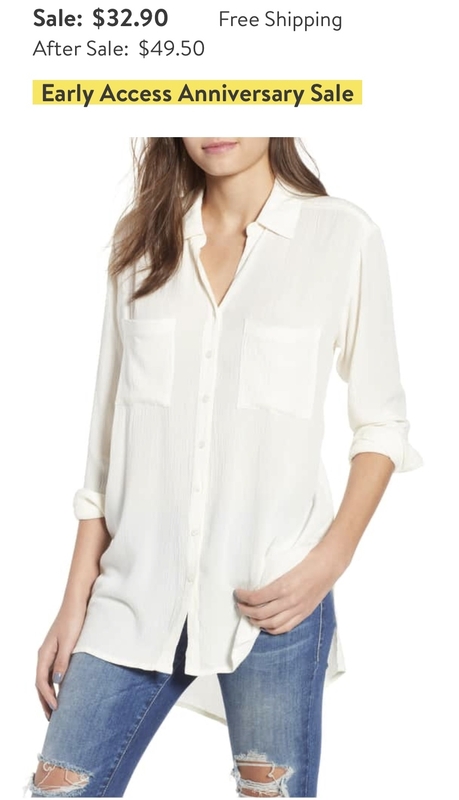 White Button Up Shirt- I didn't think much of this shirt until I saw it on another blogger. It looked like such a cute, classic, and versatile top. I think it will be one of those easy tops to throw on with a pair of leggings and riding boots and feel put together! Zella Live In Crop Leggings- I purchased the Zella Live In High Waist Leggings last year, and I loved them so much that I got the cropped pair during the sale this year! Zella Live In Maternity Leggings- I told y'all... I adore Zella leggings so much that I made my first maternity purchase! I don't know how maternity clothes run, and I don't have a clue what size I'll need in these, so I ordered my regular size medium and a size large. I originally planned on sending one back, but now I'm thinking I could use the medium this fall and the large closer to our due date... I might just keep both! Halogen Seamless Bra- I have been looking for a comfy bra that feels like a sports bra but has straps that go straight back. This fits that description perfectly, and it's under $12! 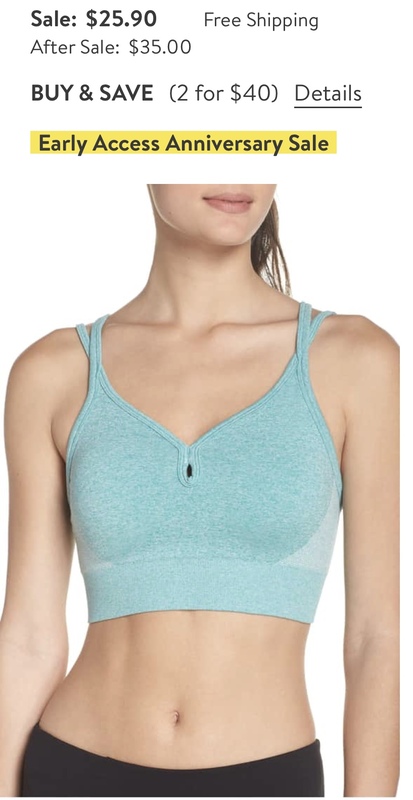 Zella Sports Bra- I also wanted another comfy sports bra. All of mine are from Target and Old Navy, and I love them, but I wanted to try a Zella one! What have you purchased?! Or what are you looking forward to purchasing when the sale goes live to everyone July 20? Remember to check out the N Sale page for more fabulous deals! Thanks so much for reading! Have a great day!